If you have recently driven along a highway and spotted a very large hawk perched on a fence post or in an old snag, most likely it was a Red-tailed. Like other species in the Buteo family, Buteo jamaicensis exhibits quite a bit of geographic plumage variation which can sometimes complicate identification. Adults have the reddish-sienna tail of their namesake, whereas the juveniles are lacking this characteristic. 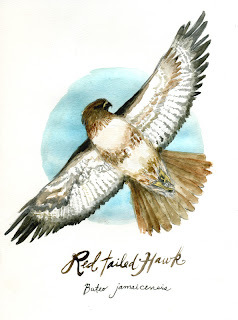 The hawk that I prepared was lighter in color, lacked the red tail, and initially it was thought to be a less common subspecies: Harlan's Red-tailed hawk. Upon further examination, it turned out to be a juvenile common Red-tailed. Harlan's plummage lacks the brown tones of the more common, and its overall appearance is more blackish and white.